I won something! I never win anything! 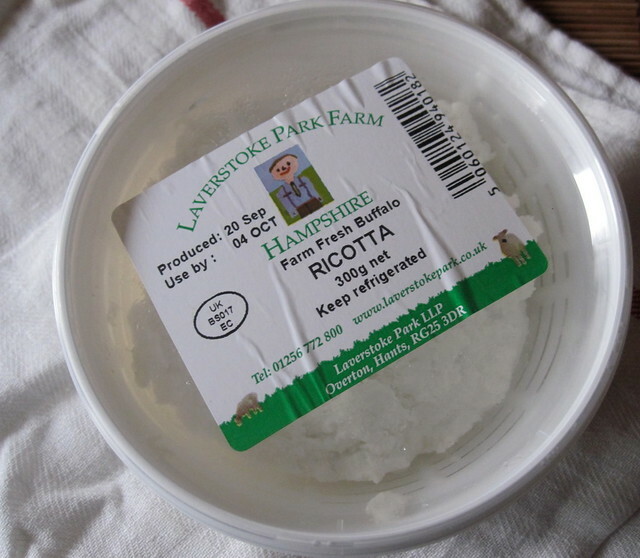 I entered a competition on the Laverstoke blog to win a parcel of their lovely buffalo ricotta and I won! What was even better is that they sent me a whole array of goodies, I got two pots of their fresh mozarella, some of their smoked streaky bacon, a big pot of ricotta and a carton of buffalo milk. We have enjoyed the mozarella on pizza and the bacon in sandwiches (naturally) and diced and combined with some ricotta gnocchi (I used the rest of the ricotta here). We aren’t sure what to do with the buffalo milk, I could make burrata (although I do have a lot of mozarella already) or we could just have it in our tea! Being as the ricotta was the main prize I thought I’d come up with a nice recipe for you. 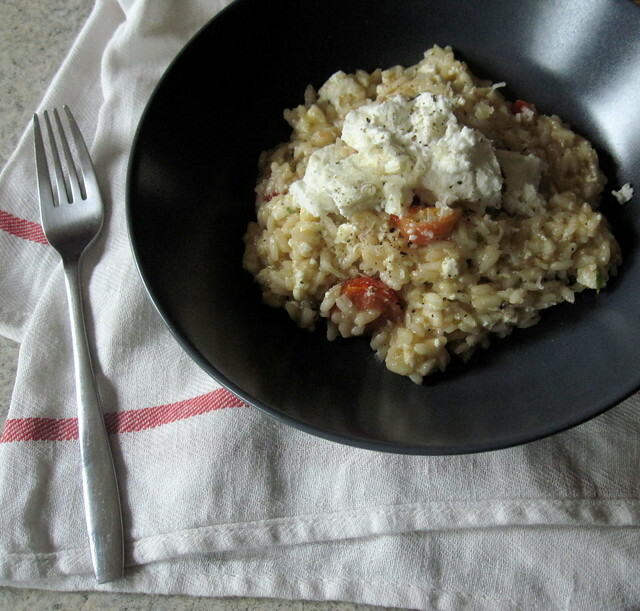 This risotto is slightly summery but comforting enough to warm you up on this early autumn days. The ricotta is baked in the oven for 10 minutes which makes it meltingly tender and allows you to infuse it with herbs. First preheat your oven to a medium heat. Put your ricotta in a small ovenproof dish, spinkle with herbs, olive oil and seasoning. Bake in the oven for 10 minutes whilst you make your risotto base. Chop the tomatoes into halves or quarters, add to a bowl and add a little olive oil, cider vinegar and seasoning. Leave to stand whilst you make your risotto. Next start to make your risotto. Melt your butter with a splash of olive oil in a large nonstick pan, add in your crushed garlic and fry for a minute. Then add in your rice. Stir quickly to coat all the rice in butter and oil. Cook for another minute. Then start to ladle in your stock in small amounts, stirring and waiting for the stock to absorb before you add the next ladle. Keep testing your rice for done-ness all the time, you might not need all of your stock. 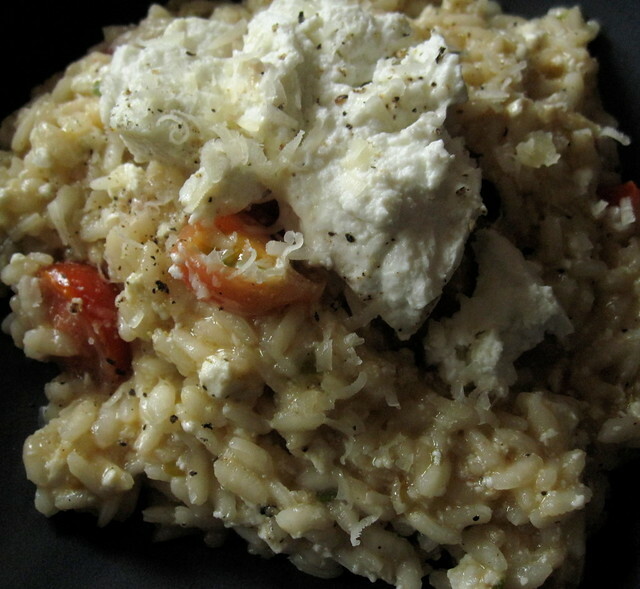 When the rice is about 3/4 done add in your tomatoes, herbs, another knob of butter and about 2 tablepsoons of parmesan, stir to combine and melt the cheese and butter. Take your ricotta out the oven. Put half into your risotto and stir in. Once the rice is done and everything combine in the pan serve in warmed bowls. Divide the rest of the baked ricotta between the plates and serve on top. Serve with a bit more parmesan and black pepper. You can find Laverstoke in branches of Waitrose and some Sainsburys. You can also buy from their website. « Ginger Molasses Cupcakes – Happy National Cupcake Week! this looks so very yummy ! I surely must try this. Lovely winnerspackage indeed.